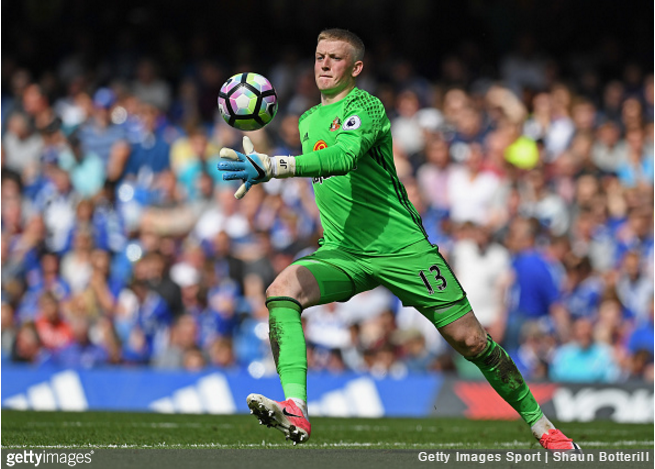 Everton are *this* close to bagging themselves a shiny new goalkeeper as their acquisition of Sunderland stopper Jordan Pickford continues to move toward conclusion. According to John Percy in the Telegraph, the Toffees are now within spitting distance of cinching up a £30million package for Pickford, who is currently away with England at the Under-21 European Championships in Poland. Negotiations have progressed between the two clubs over the past 24 hours and Everton are growing increasingly confident of signing the highly-regarded goalkeeper this month. Sources in the north-east have admitted that talks are now reaching a conclusion, with Pickford expected to undergo a medical when he returns from international duty. Everton opened the bidding at just £8million a month or so ago – an opening gambit that was subsequently described as “more of an insult” than an offer. Seems they’ve been haggled up in the meantime, with £30million looking like a relative snip for a talented young ‘keeper who may well go on to become the club’s first-choice for the next decade or so. £30m for Jordan Pickford doesn’t seem so bad when you remember it’s what Spurs paid for Moussa Sissoko, and Pickford is a better midfielder.